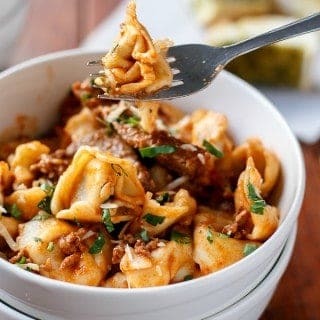 Tortellini with Chunky Beef Sauce makes for an easy dinner filled with comfort! 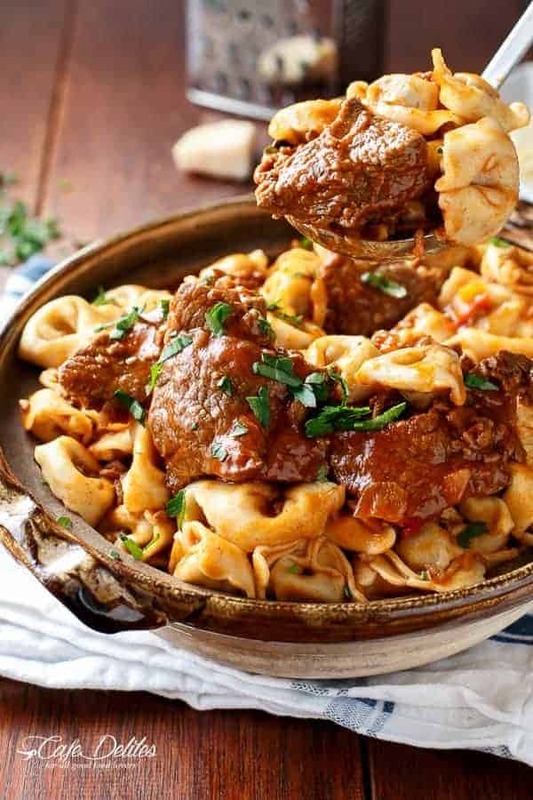 A rich and rustic sauce filled with fall apart chunks of beef coats soft pillows of tortellini. There’s nothing like a bowl of warm pasta! Rich with flavour, you would be forgiven for standing at the stove and eat it straight out of the pot. Adding tender pieces of beef through the sauce is a smart way to fill up on protein and-not-to-many-tortellinis. 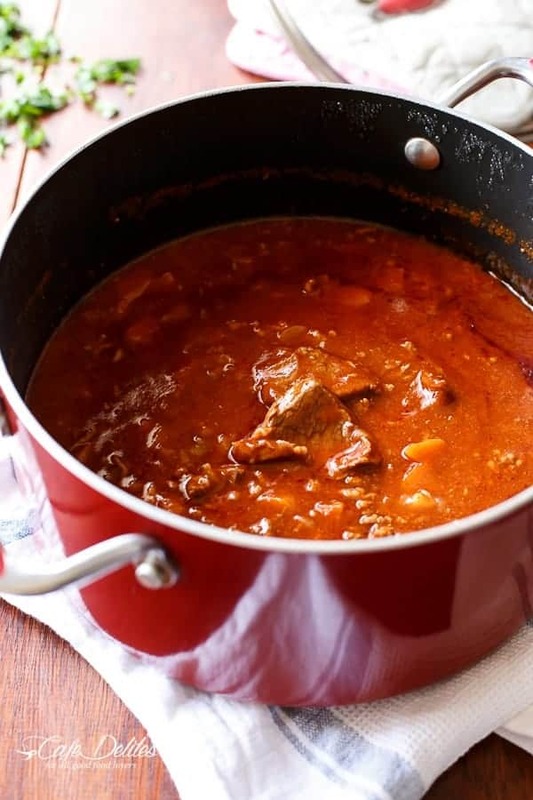 The sauce gets simmered with the beef in such a way that when you’re ready to eat, the beef is so soft and tender and full of tomato sauce flavours that you kinda don’t want this to end. Any tortellini is fine for this recipe. The sauce adds a delicious depth of flavour to whatever flavour of tortellini you use, and when it’s all done, you won’t even need to fight over a serve. Your guaranteed leftovers with some kind of sloppy joe the next day, or steamed broccoli and vegetables with the left over meat and sauce. So many possibilities with this sauce, it’s crazy. Imagine coming home after work to this for dinner! One of those foods that take you back to your childhood the second you smell home-style rustic cooking. Love pasta? Try these recipes! Tortellini with Chunky Beef Sauce makes for an easy dinner filled with comfort! 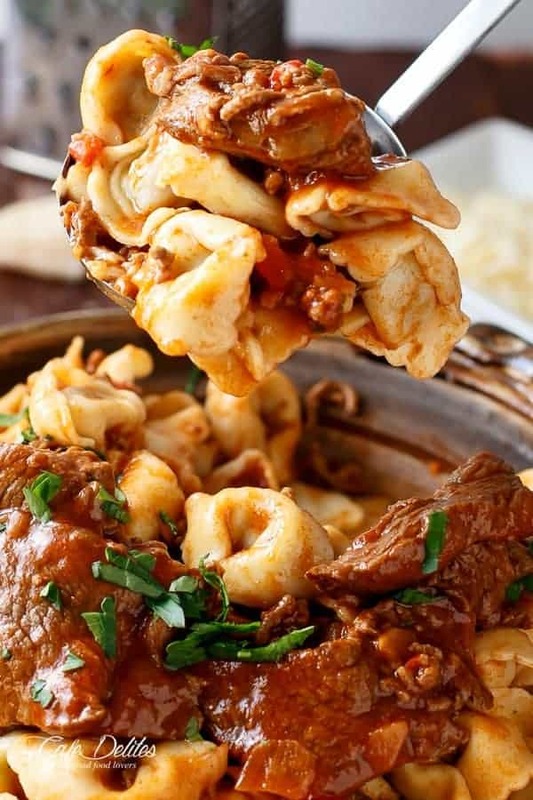 A rich and rustic sauce filled with fall apart chunks of beef coats soft pillows of tortellini. There's nothing like a bowl of warm pasta! Cook pasta in a large pot of boiling, salted water until just tender. Drain and return to pot. While pasta is boiling: fry the beef fillet in batches until browned and cooked to your liking over medium-high heat. Remove from pan and keep warm. In the same pan, fry the onion, peppers (capsicum) and carrot on medium heat until onion is softened. Sauté the garlic until fragrant (30 seconds). Brown the ground beef while breaking it up with the end of a wooden spoon. Add the tomato sauce, tomato paste and vegetable stock powder. Bring to a simmer until sauce begins to thicken and veggies are softened. Add the cooked beef fillets into the sauce. Reduce heat and allow to simmer for a further 5 - 10 minutes. Season with salt and pepper to your tastes. Top with half of the parsley. Take off the heat and pour the meat mixture into the same pan as the tortellini. Mix until combined. Sprinkle with cheese and remaining parsley to serve. 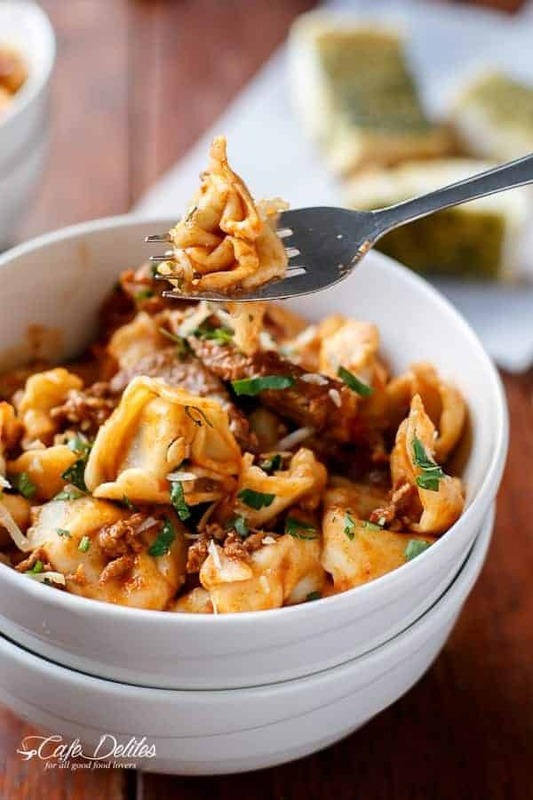 Craving this tortellini dish right now, it looks so hearty and comforting! Mmm I can just imagine how good this tastes. Plus big batch cooking and leftovers for days, this is my kind of food! I love this dish and the way you described it!